Our fit employee spotlight was created because of people like Jesse Norris. He is young, driven, and strong as an oak. 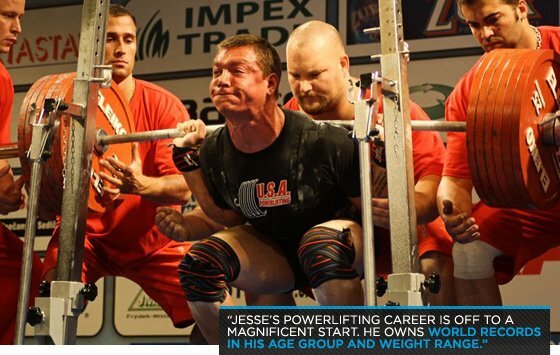 His powerlifting career is off to a magnificent start, and he holds world records in his age and weight range. Where else could he work but at Bodybuilding.com? Jesse gave us a look at his weekly training, and wow, what a brute! Rather than try it ourselves, we'll just congratulate him for earning the title of Bodybuilding.com's fit employee of the month. I enjoy being outdoors, working on cars, and relaxing with friends. My biggest priority would be getting into the gym almost every day. My position at Bodybuilding.com is in customer service as a customer service rep. I started working here in September of 2011. I have always worked out on a routine schedule, normally four days per week. However my diet was not a part of my focus at all. I would say I've always been athletic. What sort of competitions do you enter? I most commonly compete in USAPL hosted powerlifting meets. 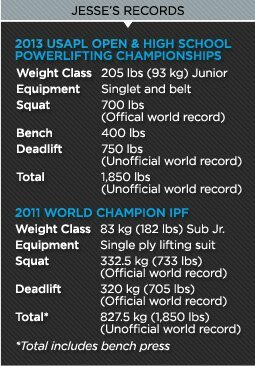 This includes Idaho State Powerlifting Championships and Men's Nationals which take place every year, and the World Championships. I also compete in any other meet I may be invited to, such as the Arnold. I have also started competing in Strongman events. How do you feel your recent competition has made you stronger as an athlete and person? My last competition, the Idaho State USAPL Meet, has brought me a lot of recognition and respect. I set three unofficial world records there in the raw division, which has raised future expectations of me. This motivates me to do better. I believe this recent competition will make me stronger as an athlete. As a person it is nice to be recognized for my successes. Why powerlifting? What drew you to that sort of competition? The weight room was always an outlet for stress and daily frustrations in my life. It grew into something I was naturally good at. Friends around me told me I should try to compete. So I did, and after my first competition I was hooked. 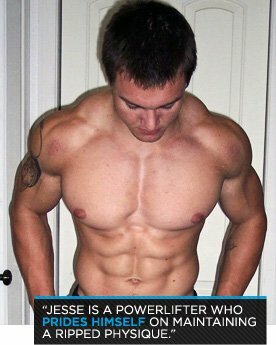 Working at Bodybuilding.com is extremely motivating for me. I get to talk to customers and hear their own stories, which are incredible. Not only do I have motivation from them but also from my coworkers. Seeing them eat healthy each night and talking about to getting to the gym later pushes me to do the same. As the company grows and changes, how have you changed with it? As the company has evolved, so have I. The site is a huge tool for information and motivation. I have had to learn more regarding supplements and different exercises. As the company has grown, I feel I've grown my knowledge base, which I can pass on to others. My co-workers are all friendly, outgoing and personable. They are all respectful people with a diverse set of individual goals for fitness and health. Is there someone in particular who inspired you to reach your goals? When I was very young, the first person I looked at as an inspiration would be Arnold Schwarzenegger. I always thought I wanted to look like that. Now I would say I'm most inspired by my Uncle Jay. Simply put, I see him as the man I want to be one day. I've inspired others around my workplace. I hear a lot of them talk about what I've done, or things they say like, "Looking good." In some cases memes have even been created about me. It certainly means a lot to me being noticed and I feel like I've made an impact. I hope in some way I motivate them. My favorite feature is the nutrition tab on the site. I enjoy being able to find recipes that I can try out. The variety helps keep me to my diet, which can get very boring. How does Bodybuilding.com help to motivate you, in fitness and life? 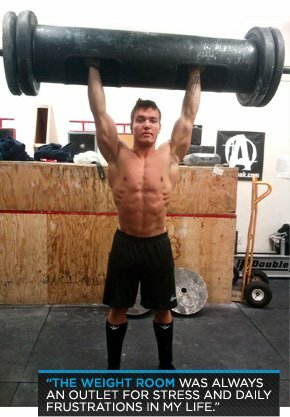 With fitness, Bodybuilding.com helps support me with my supplementation along with different workout ideas I can try out. It helps to motivate me for each workout, being able to read about and see life stories throughout the site. With life it helps me to just be a better person in general; I'm more outgoing, offering help and support around the gym or anywhere people are looking for advice. Can you guys eat real food out there? Are there pizza police on the premises? Well, I do have a cheat meal every now and then, but there certainly isn't any kind of pizza police on the premises. As a whole we all try to keep each other accountable on what we eat and do. So pizza doesn't happen too often on the night crew. Practicing a lifestyle which promotes health and fitness will always produce happier, healthier and more productive people. The people in our crew have personal goals which revolve around health and fitness. This gives them more energy and a positive outlook in all facets of their life, including work. My future goals are to write my name in the history books as the best and most fit powerlifter in history. I will be the first human being in history to lift 10 times body weight raw. With positive people surrounding me every day at Bodybuilding.com, how can I lose? Note: These are weights Jesse uses. Keep in mind I work nights, so I wake up at 2 p.m. and get to bed about 6 a.m.